With a foundation date of 1890, Sevilla Fútbol Club can boast of being one of the two oldest football clubs in Spain. It shares that honor with another Andalusian club, Recreativo de Huelva. Sevilla and Recreativo also made their mark in history by playing the first official football match in Spain; Sevilla came out victorious, defeating their oldest rivals by 2-0. During its long existence, Sevilla has won one La Liga, five Copa del Reys and five UEFA Cups/UEFA Europa Leagues. The home stadium Ramón Sánchez Pizjuán. 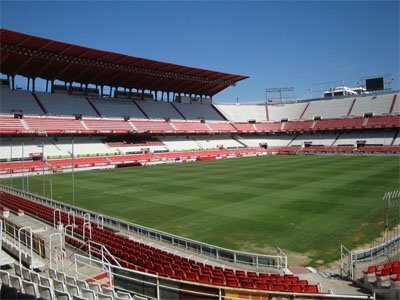 During its first couple of decades, Sevilla FC had to settle for being the best football club in its region. Out of the nineteen Championships of Andalusia played in the period from 1917 to 1940, Sevilla won sixteen, while placing runners-up in the remaining three. They further added to their trophy collection by winning two Copa del Reys in 1935 and 1939. As it turned out, the two cups were a harbinger of things to come. In 1946, Sevilla won its only La Liga to date, defeating the favored Barcelona by a single point. Another Copa del Rey in 1948 marked the end of their conquests for a long time; even though the club managed to stay near the top of Spanish football for a while yet, a financial crisis in the 70s saw them being relegated to the Segunda Division on numerous occasions during the next three decades. The new century brought some welcome changes to the club, most notably with Juande Ramos' appointment as head coach. Under his leadership, Sevilla returned to the football map by winning two consecutive UEFA Cups in 2006 and 2007. The latter season also saw them win the Copa del Rey, a feat they repeated in 2010. After being forced to sell their best players due to another financial crisis, Sevilla shocked everyone by winning three UEFA Europa Leagues in 2014 2015 and 2016. As the UEFA Cup and the UEFA Europa League are considered the same tournament, these latest triumphs saw Sevilla become the most successful club in the history of the competition. The logo contains a shield with three parts plus a classic soccer ball in the center. The picture in the upper left is the Coat of arms of Seville. In the upper right the initials “SFC” standing for Sevilla Fútbol Club could be seen. The logo has more or less been the same since 1921. Before that, the logo consisted of the initials inside a circle.